I’ve been meaning to review this journal for a while and tonight I have finally gotten round to it. 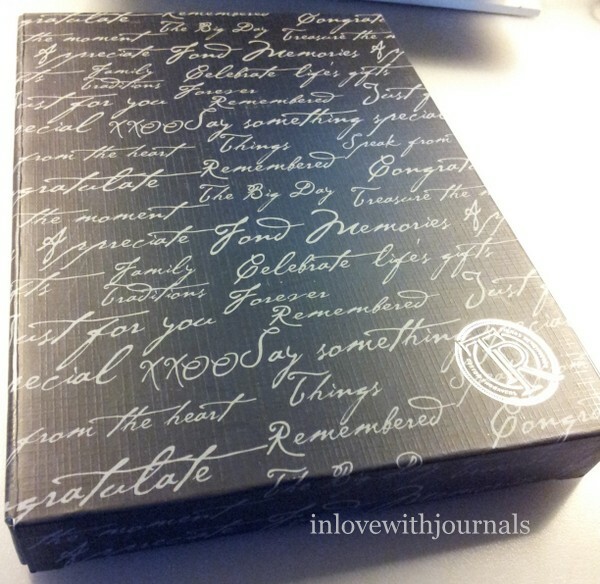 I picked this journal up at Things Remembered. 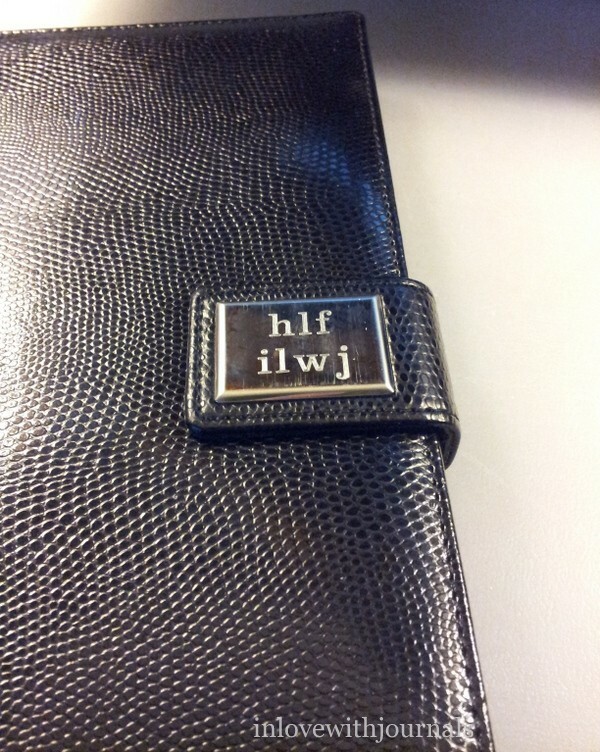 They have quite a few journal offerings, and all can be personalized in some fashion. They even have those Cross journals that I love! It comes in this nice presentation box. 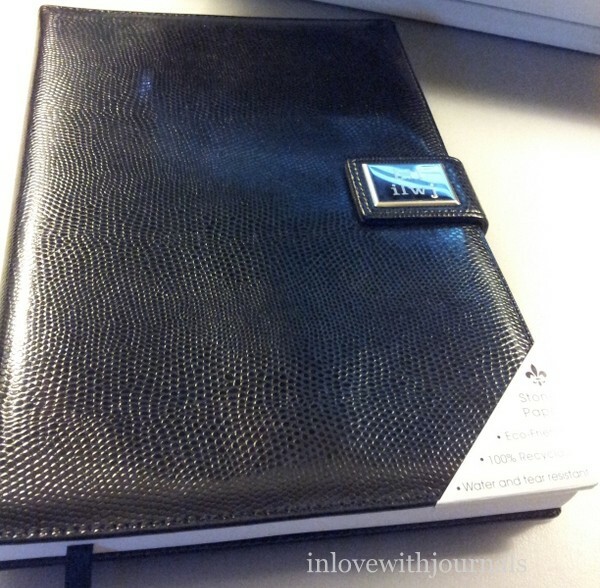 The journal is available in black, blue, grey, pink and red. And it is less than $30. The cover is a nice leatherette, textured vinyl-like fabric. And the paper is Stone paper, made from bonding calcium carbonate with high-density polyethylene. It is photo degradable and compostible, collects no static charge, is acid free, has no grain, is resistant to water, grease and insects, and tears with great difficulty, according to Wikipedia. 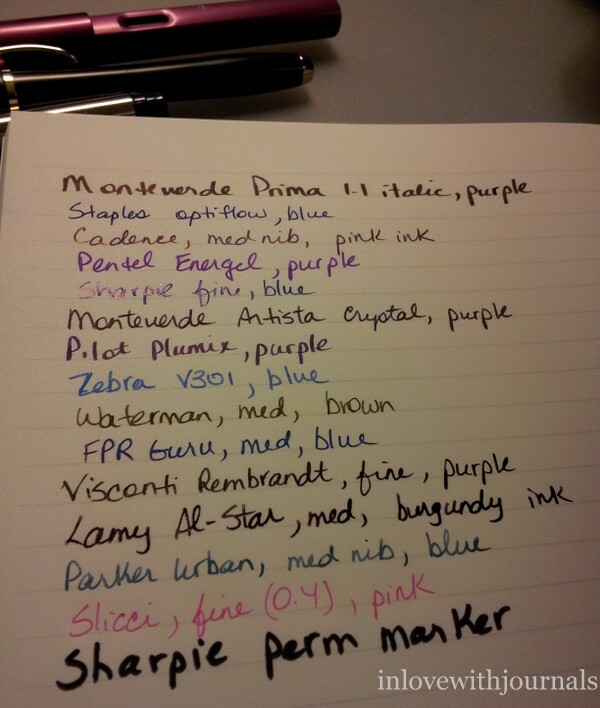 I wondered what it would be like with fountain pen ink but of course there was no way to try it in the store. The clasp has a metal cover that can be engraved. This is the Clarendon font. 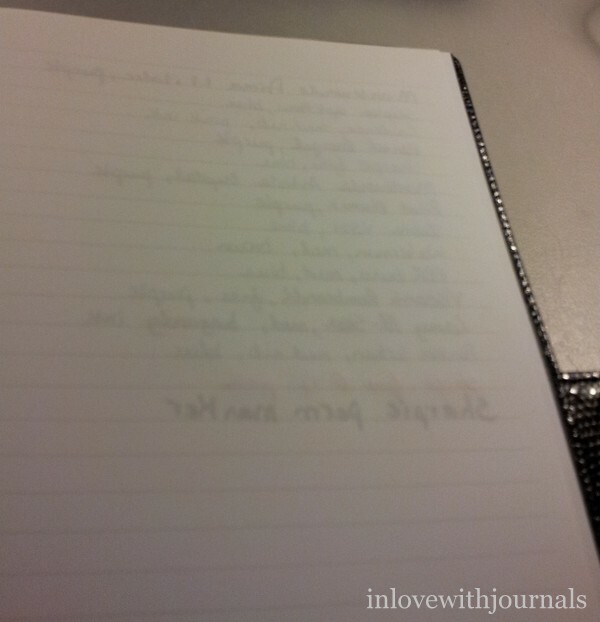 The journal comes with a ribbon marker and the crisp, white stone paper. It is not refillable. Because the paper has no grain, it is smoother than traditional paper. It is almost chalk-like. It gave my husband the “heebie jeebies” when he touched it, but my sister thought it was lovely. And it’s a dream with fountain pen ink and just about any other ink I threw at it. There was no feathering but I did experience alot of feedback with the Sharpie pen. That was the only one though, as the other pens, including the Sharpie marker, glided over the paper with no resistance whatsoever. Smooth as glass. Wonderful. It seems to me this paper is meant for fountain pen ink. There is definitely show through but no bleed through, which surprised me, especially with the Sharpie Marker. A journal made with stone is such a unique concept! 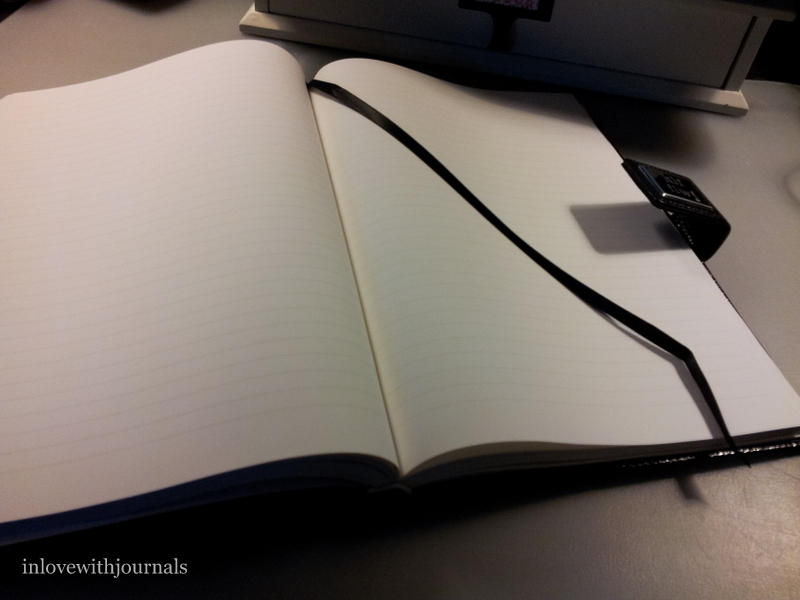 I absolutely love the feel of the paper, and the surprising weight of the journal. The paper feels very thin, so there are a great number of pages in this journal, which is an added bonus for long-term journal writers who grow very fond of one particular notebook. And writing in it is a dream, as described. 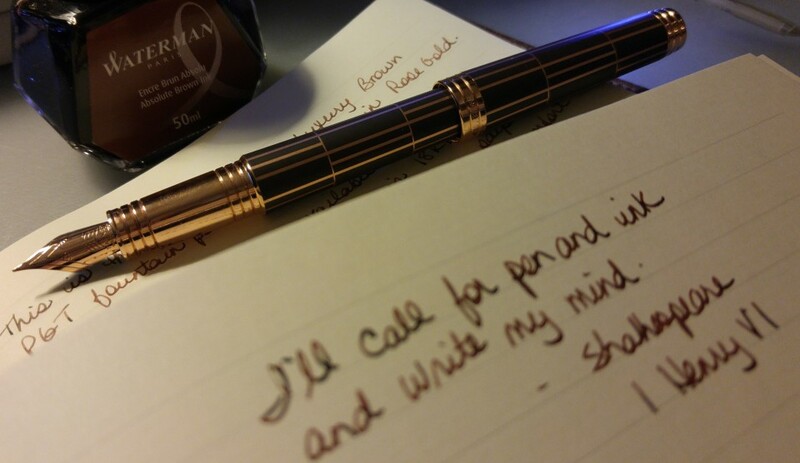 I used four or five fountain pens, both expensive and inexpensive, and each time the writing experience was as smooth as silk, no scratching whatsoever. As a lover of stones and of paper, this remarkable journal is a must have item for me. It is exquisite. Yes I forgot to mention how you helped me to road-test it. 🙂 Glad you like it as much as I do. I understand there’s been some discussion about whether stone paper plays well with the nibs of fountain pens over time. I don’t know if that is true of this particular paper, but when I asked about a similar product on FPG or FPN last year, the responses that came back suggested that it might not be a good idea to use it with fountain pens. Good point Denise I will have to proceed carefully to see if there is any residue that clogs the feed. It would be a shame because the nibs glide over the paper. Thanks for sharing that tip.